Hess was born in New York City on May 24, 1906. When he was five years old, his parents had a portrait made of him wearing a sailor suit; the likeness was titled “The Future Admiral.” His parents seemed to anticipate his naval career and his life­long interest in ocean basins. Hess attended public schools in New York and New Jersey and earned a geology degree at Yale University in 1927. After two years of fieldwork exploring for minerals in Rhodesia (now Zimbabwe), he started graduate work at Princeton University. His research on oceans began in 1931 aboard a U.S. Navy submarine with Dutch geophysicist Felix Vening­ Meinesz, who had developed a method for making gravity measurements at sea. 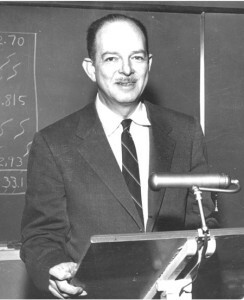 Hess completed his Ph.D. in geology in 1932 and began teaching at Princeton in 1934 where he eventually became a professor in 1948. He maintained this post for nearly 20 years until 1966. When World War II involved the United States in 1941, Hess was called from the Naval Reserve to active service. His first assignment led to the successful development of a system to detect German submarines in the North Atlantic. While captain of an assault transport, Hess did extensive echo­ soundings for studies of flat­ topped underwater sea mounts (guyots). After the war, he returned to the Naval Reserve, attaining the rank of rear admiral in 1961. As early as 1954, Hess declared that ocean floors are qualitatively different from continents. In 1959 he wrote that oceanic mantle ridges (undersea mountain ranges) were belts extruded over areas where hot rock material was pushing up through the ocean floor. Thus, unlike mountains on land, which are formed by folding and compression, sea mounts resulted from mantle processes (spreading of the ocean floor and rising of hot fluid materials above cooler ones). Hess clearly stated his revolutionary theory in geology in 1960 when he presented “geopoetry” in his essay “History of Ocean Basins” to colleagues in a mimeographed preprint; it was published in 1962. Hess’s dynamic synthesis considered the surface of Earth as an integrated system in which continents are passive passengers on moving ocean floors, not ships driving through them. He hypothesized that continents do not descend with sea floors into trenches but “ride over” them, colliding with each other, fusing, pushing up mountains, and/or breaking apart as they move. Hess developed an X­ray method of analyzing composition of lunar rocks in 1968. 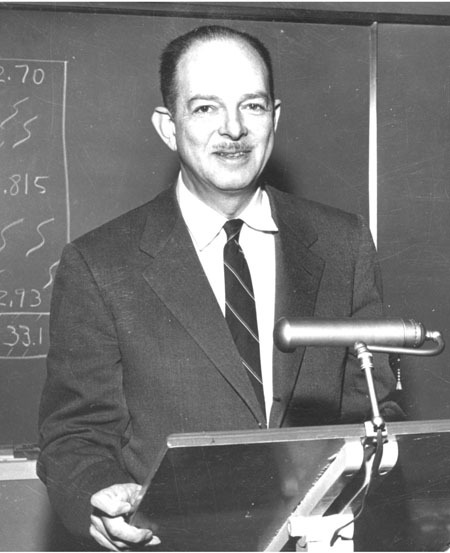 He received numerous national and international awards for his contributions to science before his death on August 25, 1969, in Falmouth, Massachusetts. Harry Hess’s theory on the origin of ocean basins provided the first comprehensive explanation of mountain building and continental drift. Spreading of the ocean floor was part of a dynamic solution, the plate tectonics model, to many geological puzzles. Hess’s model of Earth’s history was championed and given the name of “sea floor spreading” by Robert Diem, another American geologist, in 1961. Two years later, E J. Vine and D. H. Matthews discussed magnetic anomalies along the North Atlantic ridge as evidence supporting sea­floor spreading. At a London conference of the Royal Society in 1964, Edward Bullard of Cambridge presented a computer ­guided map showing the close fit of the Atlantic continents at their true margins 1,000 meters underwater. This provided a convincing model to be tested by geo chronological methods not available to ALFRED WEGENER when he proposed continental drift 50 years earlier. Confirming evidence of Hess’s ideas came in less than a decade. Fossil records from underwater core samples, magnetic stripes in sea floor rocks, and oceanic rocks in Idaho were among many assorted facts that fit into the orderly framework Hess had provided. Hess’s revolutionary ideas about mobile crust (i.e., Earth’s surface) contradicted popular views of a static Earth, but his systematic and comprehensive model became as central to geology as CHARLES DARWIN’s ideas are to biology. His contributions and encouragement of colleagues also put North American scientists into the forefront of studies on plate tectonics.